Religions and tattoos have a long history together. Some people choose religious tattoos to represent their own beliefs. Others choose symbols they like without paying attention to their meanings. Regardless of which type of customer you are, be respectful of the cultural significance of religious tattoos. Do Religious People Get Tattoos? Yes, religious people do get tattoos. For some it's a solemn ritual. For others, it's simply a joyous way to show one's beliefs to the world. Whether or not to get a tattoo is a personal decision, and that includes the influence of religious beliefs. Some religions have no rules about tattoos at all. Others forbid them. Even within a single religion, different people may have different ideas about what is allowed. It depends both on tradition and on interpretation of holy books. Among the world's most common beliefs, opinions on religions and tattoos vary widely. Here's a brief summary of ideas from Christianity, Hinduism, Buddhism, Islam and Judaism. To learn more, search the web, ask a friend who grew up in one of these traditions or contact a local church, temple or mosque. Some Christians take this to mean that tattoos are forbidden. Others choose to interpret this whole verse as referring to funeral rituals, not to ordinary tattoos. And some believe that the "marks" refer to idolatrous images. Supposedly, scarring and tattooing were popular among non-Christians; Christians were forbidden to have other religions' marks on their skin. Some tattoo enthusiasts choose to interpret two other Biblical verses as saying that tattoos are not only acceptable, they were - at one point - divinely ordered. Whether these verses refer to tattoos at all is very much open to debate. The Jewish view on tattooing includes the same bible verses mentioned above. Orthodox Jewish tradition essentially forbids any permanent changes to the body, except for the circumcision of boys. The reason is a matter of discussion, but it's often said that the body is a gift from the Lord, and therefore sacred. Making permanent marks on the body shows disrespect. (This prohibition does not extend to tattoos done for medical reasons, such as chemotherapy.) So for many Jews, tattoos are not allowed. Even secular (non-observant) Jews often feel uncomfortable with the idea. On the other hand, it's a Jewish tradition to argue about the meanings in the Torah (the Jewish bible) and there are certainly Jewish people who love tattoos and have no problem with getting inked. Many Asian cultures have a long history of tattooing. 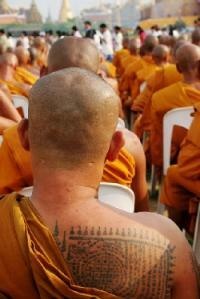 Buddhism does not forbid tattoos. In fact, some Thai monks will give tattoos that serve as amulets, keeping the wearer safe or providing strength in the face of crisis. Try LuckyFishArt.com for some examples of Buddhist tattoos. There's no prohibition on tattooing in Hinduism. 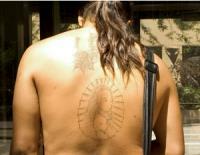 In fact, some groups in India include tattooing as part of their culture. Many Hindu images are very intricate and beautiful, and a Hindu or Indian design can make a striking tattoo. Sometimes religions and tattoos don't go together at all. Tattoos are not only forbidden in Islam, they can permanently prevent someone from being at peace with god. In general, Muslims may not make any permanent changes to the body to enhance beauty. For most Muslims, tattoos are considered ornaments, and are included in this ban. A few religious leaders do disagree, and for secular Muslims having a tattoo may not be a problem at all. If someone with a tattoo converts to Islam, the tattoo may be accepted as part of the person's past. However, new tattoos would be considered not just disrespectful but haram, or forbidden. Designs vary from one religion to another, as each religion has its own symbols of religious significance. Christian tattoo designs include crosses, the Virgin Mary, verses from the bible and the Icthys or Christian fish. Jewish designs include a Star of David, the outline of the historical land of Israel or Hebrew lettering. Buddhist tattoos center around images of the Buddha, bodhisattvas, lotus flowers and Dharma wheels. Hindus might show their faith with images of Hindu deities or traditional Indian art. Islam can be tricky, as images of Allah and Mohammed are generally forbidden and considered offensive. Though a Muslim might get a tattoo of a verse from the Quran in Arabic or the crescent and star. When getting a tattoo of a religious symbol it is important to be sensitive to its meaning, even if you do not believe in the religion. If you are a religious person, give serious thought to whether or not getting a tattoo fits in with your religious values. 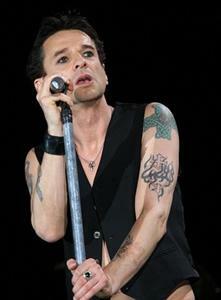 A tattoo is for life and thus can be a powerful show of religious commitment. It can also be a very long-lasting mistake if you decide later that it is not in keeping with your values.